The Audio Pac Demo had been done by Sunnyboy and Nexus 6 on their own. They managed it to hide the whole project until it had been finished. Maybe they wanted to decrease the damage which my New Year Demo had inflicted as it slipped through my fingers and reached the outside world. The Audio Pac Demo is mainly a music demo with some nice side effects. You can play Pacman while listening to all the tunes. 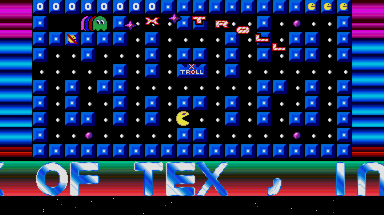 There are rasters all over the screen as well as some nice sprites. Besides some borders (left & right, bottom) are removed in the lower part of the screen. After cracking and ripping all our games, there where still some bytes left and Sunnyboy decided to hack the union demo. Encouraged by the easy progress, He attempted to crack the cuddly demo once again and succeeded. Every bit of chipmusic was ripped and packed into this demo. If you want to look at it, just download this disk-image it runs perfectly on STEem 2.2 or SainT 0.99. As a side effect of this demo we learned how to code "real" joystick and keyboard routines and simple game logics. That had been an important step towards a real game.